This popular Mediterranean-style Jewish appetizer salad consists of marinated, grilled sweet peppers with extra virgin olive oil and garlic. 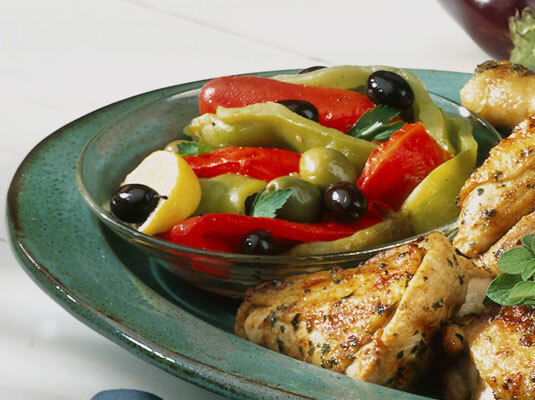 Garnish the pepper salad with your favorite Middle Eastern or Mediterranean olives. For extra punch, you might like to sprinkle the peppers with a few capers just before serving them. Put peppers (whole, with their stems still on) on grill or broiler rack about 4 inches from heat. Grill or broil peppers, turning every 4 or 5 minutes with tongs, until their skins are blistered and charred, about 15 to 20 minutes. With tongs, transfer peppers to a bowl and cover them tightly. Or you can put them in a bag and close the bag. A plastic bag works most easily, but you can use paper if you prefer. Let peppers stand until cool enough to handle, about 10 minutes. Peel peppers using a paring knife. Be careful when peeling the peppers! They’re still hot inside and may contain very hot liquid. Remove pepper cores and seeds. Cut each pepper in 4 to 6 pieces lengthwise. Put peppers in a shallow dish. Add garlic to the dish. Whisk 2 tablespoons oil, 1 tablespoon lemon juice, salt, pepper, and cayenne. Pour marinade over peppers and turn pieces to coat them. Let peppers stand at room temperature for 30 minutes, or cover and refrigerate them overnight. Turn them over a few times in their marinade. Arrange peppers in a shallow serving dish. Add remaining oil and lemon juice to marinade and taste it for seasoning. Pour the marinade over peppers. Garnish with olives and parsley sprigs.